Although, there's not that much to say about buffets, they are so wonderful, they deserve their own post. My first encounter with a buffet was on the bus from the airport to my hostel. I remember looking out of the window and seeing beautifully illuminated buffet restaurants with piles of food. I remember wondering about the dynamics of such a place and how much I could physically eat if I ever went there. After a little investigation, the dynamics became very clear. There are buffets where you help yourself and you get charged by weight (not your weight thank god!) and there are buffets where you get served and pay by dish. Where you help yourself, you just help yourself. When you pay at the end, and they assume you want rice and charge between 5-10NT. If you don’t want it, you have to tell them. In the buffets where they serve you, rice is sometimes free, and you also pay at the end. Both types have free soup and sometimes tea! By far, the best meat lover's buffet is the Taipei University Hospital Buffet. 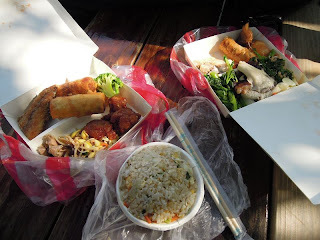 For less than 100NT ($3.20) you get fried rice or noodles, soup, tea, and literally a mountain of food selected from about 100 different dishes with meat, fish, vegetables, tofu, anything you can dream of! I feel sorry for vegetarians, but in Taiwan they can count their lucky stars! There are also vegetarian buffets where they have such convincingly real looking vegetarian food, you will be sceptical just by looking. But if you look around you will probably see a couple of buddhist monks enjoying the food, so even though it might look like, taste like and smell like meat, it isn't! I visited three vegetarian places. One near the Taipei Main station (as recommended by lonely planet), one near Shandao Temple MRT, which is a little cheaper, and just as tasty. I also went to one on Heping Lou. The one on Heping Lou (Near Shida) is a total rip off for foreigners and I would not recommend it.